Greenleaf was so tantalizingly close, Gingersplash could practically taste it. Long behind them were the bitter days of Leafbare, when the forest had been stripped bare of its luscious beauty, and the prey had retreated to their warm and cozy burrows. No longer was the air fraught and bitter. Nowadays, SkyClan's territory was a shrubby wood of color; flowers bloomed bright under the shade of the trees, and a breeze carried the sweet scent of vole and mouse. Sunlight flittered through the thick canopy of branches above, splashing the prickly forest floor below with splotches of watery light. Through this pure, uncontaminated land moved a lean tomcat; he was scrawny, his fur clinging awkwardly to his sides, and one could count every rib beneath his pelt. He certainly did not look wild, however; he was immaculately well-groomed, his wide eyes shone with a deep wisdom, and his coat was sleek, unusually so. This tomcat, aptly named Gingersplash for his random splashes of pale ginger splotching his pelt, seemed out of place within these thick woods. And indeed - if one were to see him standing next to other SkyClan warriors, he'd look meek and small by comparison. This was of no bother to him, however. At least, that's what he liked to try and convince himself of. In truth he'd always feel insecure about his differences compared to his denmates. He'd never been very popular around his fellow warriors - never bullied, but certainly overlooked - and he'd become rather used to the disjointed isolation he felt from his own Clan. Gingersplash heaved a deep breath, relishing in the fresh taste of clean air. He caught a trace of plump mouse on the wind, though he ignored it. Hunting was the last thing on this warrior's mind. Instead he turned away from the billowing scent of prey, and, bowing close to the ground, he managed to catch the slightest hint of juniper berries, their sweet tang dancing tantalizingly close to his nose. He was no medicine cat - nor did he ever want to be one. But he found something relaxing and - dare he say it - comforting about visiting the medicine cat's den. He'd been doing so ever since he was no more than a young apprentice, and it had been a habit that had stuck with him right until now. Bounding forward, enthusiasm in his every step, he soon stumbled upon the batch of bruised-blue berries, perched quaintly on the stem of a juniper bush. Gently, so as not to crush his precious cargo, he snapped the stem and awkwardly lifted his prize up high. With poise in his gait, he began the slow trek to camp. He hoped these would be of some use! Tawnygaze was often so busy...well, he didn't mind going out and fetching some herbs. In fact, it was rather enjoyable. A nice break away from the normal duties of a warrior, duties that he found himself sorely failing at...With an irritated shake of his pelt, he picked up the face, finally emerging into the wide open clearing of SkyClan camp. He didn't stop for greetings. Ignoring the curious gazes of a few warriors, he padded quietly passed them and pushed his way into the medicine cat den. Relief and happiness crossed his countenance upon seeing the familiar form of Tawnygaze, and he raised his tail in a friendly greeting. "Tawnygaze. Hello," he meowed, his voice slightly muffled by the juniper berries clamped in his jaws. He placed them gently on the ground and stood back, feeling slightly foolish all of a sudden - this was a not-very-warrior-like thing to do. Then again, not many warriors nearing their fortieth moon hung out with the elders and medicine cats like a lost kit. He quickly pushed such toxic thoughts from his mind. "I thought you might need some of these...er...juniper berries, correct?" He cocked his head, still slightly confused at all the various names for herbs and plants. "Let's see...they're good for...stomach ache...is that it?" The clan had been buzzing for the past few days, every cat excited over the return of newleaf. With the newfound warmth came relief from sickness, the return of prey, and easy living for all, but for the medicine cat there was a different sort of relief that came in the changing of the seasons. The herbs once more began to grow throughout the territory. Though Tawnygaze had done her part to stock up before the early frosts could kill off the valuable growths, she couldn’t lie and say her stores weren’t looking a little bare now that leafbare was showing its tail behind them. So yes, relief had found her in the form of running prey and thawed streams, but more than that it was in the vibrant buds of flora peaking up through the loamy soil of Skyclan territory. Even so, on a day as perfect as this one, Tawnygaze was far too exhausted to think about venturing very far out of camp. She had been up through the night helping one of the queens with a particularly difficult kitting, and in the sweet caressing warmth of the new day it was all she could do to stay awake. The fae had already sent her apprentice away on minor tasks, the energetic young cat proving a bit too much to handle on that particular day. Doing so, though, had left the medicine cat alone to take stock of the herbs she had left over. ”Tawnygaze. Hello.” The she-cat’s head jerked at the sound, her entire body having been on a lilting descent to the floor of her den when the tom had made his arrival. Tom… Tom? Why would a tom be coming to see her? Was he hurt? He didn’t seem hurt, and the only tom that came to see her without bearing any mark of injury was either Deertail or Gingersplash; or her father of course but Waspnose was out on patrol for another- Gingersplash?! Burning eyes widening with anxious shock, Tawnygaze quickly shuffled into a position that would place her twisted leg on the far side of her body, away from his eyes. She had somewhat gotten over the rest of the clan seeing the marred thing, but not him… She didn’t want him to see that wasted limb, disfigured and grotesque as it had become. ”Gingersplash!” His name came out in a blurted jumble of syllables, falling over each other in an attempt to reach his ears first. All of a sudden she had the crazed thought of what she must look like, and immediately regretted ever thinking about her appearance in the moment of agonizing dread it delivered her. Horrible, she must look horrible, up all night with no rest and hardly any kind of meal there was no other word that could possibly describe her mangled form. She looked like a curse, but here he was as fate would have it, his fur groomed into sleek perfection and each muscle taught in a sinuous line that promised the capable power of a warrior. He was beautiful, and she… Well, she probably had a good personality. With some surprise, if it were possible that Tawnygaze could become any more surprised than she already was by his presence, the medicine cat realized he came bearing a gift. In his mouth hung a small pulling of a branch with a number of night black berries dripping like luscious little lies from the stem. She watched him place it down like an offering, and for a moment had to think about why this sudden sense of nausea had come across her like a blanketing of dread. ”I thought you might need some of these…er…juniper berries, correct?” ’No…’ A voice answered immediately in the back of her mind, but she couldn’t quite understand why. ”Let’s see…they’re good for…stomach ache…is that it?” Stomach ache..yes that sounded right, but why did she feel so uneasy? Perhaps other warriors frowned upon his frequent, unnecessary meetings with the beautiful fae - though in all honesty, Gingersplash couldn't care any less. A mere glimpse of her petite build, the slightest catch of her sweet purr, and his previous frustrations and insecurities simply melted away, like mist in morning sunlight. And for a cat with very little acquaintances within his own Clan - and even less friends, so to add - then why not spend his time with the she-cat? She didn't seem to mind his presence - at least, he hoped not anyway. Disregarding that even, and none could deny the particularly calming effect she wielded upon this tom. He treasured their rather unusual friendship and looked forward to every meeting that would occur. "Gingersplash!" spilled Tawnygaze's rushed meow, just nearly avoiding jumbling his name. There was an awkward shift, as if she were trying to hide something, though Gingersplash would be a fool if, after all these moons, he hadn't known just what. A dark shadow crossed his furry face and hazy memories washed fresh upon his mind - memories of the previous medicine cat, Juniperjaw, and the horrific occurrence that had left the once vibrant she-cat Tawnygaze bound within the medicine cat den. Rogues had done it - foul creatures they were, hardly worthy of being called cats - and subsequently the encounter had changed her life forever. He could hardly imagine what she'd been through. To have her path change so drastically in life seemed terrifying to Gingersplash. Sure, he mightn't have been the most talented or competent of warriors, but this was his destiny - whether he liked it or not - and he walked this road knowing it had to be done. So to have everything he'd ever known stripped away from him like she had? So cruelly too? He could barely begin to comprehend how difficult it must've been. But she had found a destiny, he reminded himself; one that he hoped proved much more fulfilling than that of a warriors' life. Initially Juniperjaw's retirement had frightened him - what if the next medicine cat was reproachful to his frequent visits? - but so it happened that he forged an even stronger bond with Tawnygaze, and the thought sent a delighted trill rushing like a current through his veins. Still she was incredibly self-conscious of her leg, and even now she tried to hide the twisted limb. He didn't see the scarring or the maims when he looked at her however; he saw not the scars and deformity, but rather the beautiful mix of her swirling ginger patterns, her dark streaks of near-russet set upon pallid auburn, and her deep almond-shaped eyes shining with a wisdom and knowledge beyond his years. She was irrefutably beautiful and he longed to tell her such - though how strange would that sound? Hello, Tawnygaze, I just wanted to say you look very alluring and attractive...! No, now that would be weird! He was rocked out of his thoughts by her thin wisp of a voice once more and he had to lean in closer to hear the she-cat. "Yes, mainly that's what I use it for," she said in reply to his question and it was at this moment that Gingersplash suddenly realized how exhausted she looked. Her dark orbs were shadowed with fatique and even her voice - quiet as it normally was - sounded as fragile and tender as a single thread of hair. By instinct he immediately touched her shoulder blade with his tail tip, blinking in concern at the medicine cat. He was about to ask whether she was alright and if she needed him to go grab a piece of prey by the fresh kill pile - when it was with a jolt that her words became abruptly serious and she returned at him with a question of her own. "You didn't get any in your mouth, did you?" Tawnygaze asked, and he promptly shook his head in response. He allowed his tail to drop from her side and instead curled it neatly around his paws. A hint of confusion sparked in his own wide orbs. "I don't believe so..." he meowed, his eyes darting back to the dark berries before him. A sudden chill swept through his being and he swallowed, understanding finally beginning to creep near the crevices of his mind. "Why? You don't think they're-" He stopped at once, inhaling the deliciously sweet smell of what he'd thought were nothing more than harmless juniper berries. Then again...they were dark. Unusually so. Her words confirmed his growing fears - "they're poisonous." At first he didn't know what to think. In retrospect he shouldn't have felt so upset - it was only a mistake, and one Tawnygaze had swiftly caught onto - but at that time he couldn't stop a sickening bile swirling deep within his gut, and frustration clouded his usually so clear and wise mind. He'd done it again; being a failure of a fighter was one thing, nothing more than an okay hunter another, but to nearly endanger the Clan by bringing back such a threat? He could hardly forgive himself. "I'm sorry," he murmured, dipping his head in acknowledgement, and he was thankful that he'd managed to keep his voice calm and level, his face expressionless and unreadable as ever. "I honestly didn't know...ah, no cats ate them, I can solemnly swear to you that! Nor did I swallow any." But what good would that do? He'd still brought these back to camp. He sighed - beating himself up was pathetic, especially in front of Tawnygaze, and instead he forced a small smile, once more turning his thoughts onto more pressing issues. "Seems like the arrival of Newleaf also brings some dangers. I thought Nightshade was a rarity to find, though I thought I could see a few of these growing throughout the territory. Maybe we should alert Pinestar later about the flora." He once again stole a glance at Tawnygaze. "I can take care of disposing these...but why don't you get some rest? I can bring you some prey. A vole? Mouse, maybe?" It felt like clouds were swimming through her head, and not just because of a lack of sleep. The tom’s presence was subtly intoxicating, sending thoughts through her jumbling mind and tantalizing her with imaginings she hadn’t had in ages. ’It’s because of the kitting.’ Tawnygaze told herself reassuringly, desperately searching for any reason that he would have this effect on her. ’It’s because of the new litter and that’s it. You’ll be fine again once you get some sleep.’ Yes, yes. She would be fine once she got a good night’s rest. A feathered weight upon her shoulder jerked away that comforting piece of assurance, though, and the medicine cat turned her head to see a ginger tabbied tail resting against her pelt. Something about that comfort, that gentle consolation of presence and peace, took her back to her kithood when the luxury of her father’s tail wrapped her in a shelter of safety and protection was a familiar normalcy. The abrupt urge to collapse into that dexterous limb hit her like a falling limb, forcing youthful innocence down her throat until it threatened to burst from her ears she was so full of it. Gingersplash was a sweet tom, a kind tom, a good tom; he wouldn’t hold it against her to show some small amount of weakness here. He would just smile, and keep watch over her while she slept. He wouldn’t mind at all. Orange eyes blinked at the thought, only mostly her own, and she quickly fled such daydreams as if succumbing to them would lead to further disaster than even the marred knot of her leg could testify to. What was she thinking? Dear Starclan she must be more sleep deprived than she had thought if she was inventing a reality where she and Gingersplash might have any reason or excuse to spend a few lazy moments napping in each other’s company. ’Get your head out of the clouds, and pay attention already!’ Tawnygaze snapped at herself inwardly, silently finding more and more hurtful chastisement with which to anchor her thoughts in the present. She had been about to say something; something about… Ah! Gingersplash shook his head promptly in response to her query and Tawnygaze couldn’t deny the sense of relief that settled over her. When he removed his tail to curl it around his paws, the medicine cat was oddly proud of herself for only vaguely noticing his absence; as if she were back in the warriors’ den and realized the departure of a warm body in the bridging cusp of sleep and wakefulness. However, it wasn’t his tail which caught her attention, rather, it was the restrained fall which took to his frame like a weight settling upon his shoulders. Looking at his face, watching the different emotions play out in his vividly hued eyes, Tawnygaze was shocked at the question which entered her head; had she hurt him? But just as soon as she caught this glimpse of his turmoil, it was gone again beneath a mask of unreadable reservation. A part of her was stung at the way he hid himself, jumping to a hasty conclusion that in pointing out his error she had offended him. Yes, of course. She had offended him and that was why he shut down so completely, that was why he pulled away from her. Guilt crashed against her like the cruel weight of the river’s current; all she wanted was to reverse the tension, to return to the moment when his tail rested upon her shoulder and she was young again and naïve in her dreams. But it was too late, far too late, and as Gingersplash further solidified his untouched exterior, Tawnygaze could feel him receding away from her, pulling back to show her only what everyone else could see. It hurt like a physical wound, as if she could feel him disappearing into himself and thus tearing away from her company. When he murmured an apology she flinched, ducking her head as if expecting his claws to lash out for her ears. Quick was her recover, but even quicker was the distance she put between them like a barrier for her fragile emotions and tender perception of this tom. ”I honestly didn’t know…ah, no cats ate them, I can solemnly swear to you that! Nor did I swallow any.” Tawnygaze nodded, a bit too jerkily for the movement to appear natural, and absently allowed a paw to drift with delicate muse across one of the berries. ”Not many cats do, they aren’t often used…” Her thoughts were lost in the want to bring him back, to see him smile again. His smile was infectious; everything would be well if he would smile. Everything would be alright then. ”It’s a relief no one swallowed any. You should memorize what these look like. Even though you’re not a medicine cat, they are a good berry to recognize.” Her paw pushed the twiggy bunch toward him, her eyes averted in shy uncertainty. Would he be further offended that she suggested he learn more about this deadly plant? Had she just angered him further? With timid hesitation, Tawnygaze forced her eyes upward to see his face again, their ascent slow with defiant struggle. She was ready for anything – the same apathetic mask as before, a look of furious indignation – but the small smile she found knocked her off guard. Was he not offended? Or did he think she was joking? Her ears twitched back for in a show of indecision before she too risked the smallest of smiles, her tail pressed in a tight curl against her twisted leg as she stood in a bunch, almost cowering stance. "Seems like the arrival of Newleaf also brings some dangers. I thought Nightshade was a rarity to find, though I thought I could see a few of these growing throughout the territory. Maybe we should alert Pinestar later about the flora." He'd always struggled with even the simplest of tasks, Gingersplash had; cold, bitter memories swirled like an aching mist within the crevices of his mind, images flashing before his soul's eye of a blue-eyed beauty, soft fur as white as freshly fallen snow, and yet her graceful poise hid a striking cruelty, an ambitious ferocity that lurked beneath her carefully worn mask. A shudder rippled down his spine, cold claws of dread digging deep as thorns into his bosom. His previous mentor, Frostfoot, had never been a swell match; her cruel, driving force had been the complete opposite of Gingersplash's placid nature, and to this day every failure stung like nettle, as if Frostfoot would emerge from the shadows and taunt him for his continued uselessness. He knew he shouldn't be so self pitying. After all, the past was the past; every cat had their own personal grievances to deal with, the sufferings of moments long gone that lasted throughout one's life. He swallowed a sigh, feeling even more pathetic, as in retrospect sulking about and feeling sorry for himself really wasn't warrior-like behavior. The tomcat's meadow green eyes roamed back to the cider splotched she-cat, and he wondered, maybe, just maybe, would life have been different if he'd served in her position? Managing herbs, treating the sick, joyfully welcoming young kittens into the world...Tawnygaze must've been happy. He couldn't imagine a life much sweeter. A gentle smile graced his lips, this time true instead of forced. He hauled himself to his paws, a purr beginning to build deep in his maw. It was funny, the strange effect she had on him. Suddenly, one glance into those deep, bottomless eyes of hers, and all his previous doubts seemed to simply melt away. It was as if she lent him strength, blessed him with a confidence he never knew he had within him; his heart quickened, heat rushed beneath his fur, an uncomfortable warmth rushing like a blazing fire down his skin. She glanced at him under long lashes, and it was as if his heart had turned to butter. He sucked in a cold breath, savoring the bitter, frosty air of the camp. Honestly...what had come over him? Acting like a love lorn kitten...He shook out his sleek pelt, hauled himself to his feet and shaking each and every individual paw, carefully inspecting for dust. It was a silly habit, one he'd possessed since kittenhood; always a stickler for cleanliness, not even the tiniest speck of dirt could escape his sharp, hawk-like gaze. His ears pricked as Tawnygaze spoke once more, and he felt his heart lift at her words, relieved that his failure hadn't been so pressing after all. "Well the berries can actually stay...they do serve a purpose, and it's been a while since I had a fresh supply of them, but..." She turned to him, one paw held up, not quite meeting his eyes. "I don't want to impose any. I can get my own prey. You should take care of yourself. I'm sure you're hungry." "It's no trouble at all!" The words escaped his lips before he could think them through, and he blinked, long and slow, as if surprised at his own sudden burst of confidence there. But it really wasn't; every moment spent in the company of Tawnygaze was, without meaning to sound sappy, like a dream. And he meant that in every sense of the word. Here, he wasn't just another SkyClan warrior; he wasn't just a mentor to the bossy Vervainpaw, wasn't just another campmate to count towards the growing masses of SkyClan. Here he could be who he wanted to be, and he was accepted for it. The medicine cat den had always been a place like that for him. A safe haven, a den that welcomed him with wide open paws. It was at this point that he suddenly noticed how tired Tawnygaze was. Normally he'd submit to her kind comments; she didn't want to impose, and he didn't want to impose either. But a rare flash of determination caught him off guard. He brushed rather close to Tawnygaze, drawing in her sickly sweet scent. He felt a burning heat rush to his cheeks, but he stood in place, relishing in the warmth that radiated from her skin. Draping a tail across her back, he gently nudged her away from the herbal storage, his building purr culminating into a deep, rich rumble. "Come on..I'm sure the Hunting Party is back by now. Even Medicine Cats need to rest." He hadn't exactly meant to sound so...intimate. In Gingersplash's defense he himself was feeling the sleepy, almost intoxicating draw of sleep; it must've been the thick scent of herbs and berries, lulling him into an almost comforted, drifting daze. He wasn't exactly in his right mind, but...but being so close to Tawnygaze, it felt right, filled him with a sense of peace he'd so desperately been seeking. With another gentle nudge he slowly attempted to guide her away from her herbs and fruity concoctions. The next words he uttered took a whole lot of bravery, and he paused, mustering every single minute cell of energy required, before meowing, "...why don't we share?" Tawnygaze’s amber orbs flashed upward into the tom’s own warm gaze. He was warm and comforting and soft in a way that was strong, and most of all he was looking at her; at her and not away from her leg. ”Well…” The femme glanced back at her stores still half organized before finally giving a single nod and slowly letting herself be led along by the tom. ”I suppose sharing a meal would be fine..” Her voice was soft and breathless, something completely dreamlike about this experience seeking to steal her speech away entirely. But maybe this was a mistake… Maybe it would be better if she just went back and completed her work, Starclan knew there was plenty of it, but the moment for escape had already passed. Gingersplash was already taking her through the den mouth and into the light of the camp. Tawnygaze’s ears flattened briefly in realization of how close they were, and she shifted away ever so slightly despite the want to remain tucked warmly against his side. She had her place, though, and it was not tucked against the side of any male despite how keenly she may have wanted it to be so. As her eyes shifted downward, avoiding the gaze of any cats present in the camp, Tawnygaze couldn’t help but regret – for what may have been the first, honest time – the path her life had taken. She accepted - for a moment it felt as though his heart had halted deep within his breast, every signifying beat pausing for what seemed like a century long, though in truth it could not have been longer than mere seconds. Something sharp pressed against his adams apple; a pang of pain that rippled uncomfortably through his throat as he swallowed, a shudder crawling like an infestation of maggots along the curve of his spine. Why was he so uncomfortable just now? As if he'd broken every rule within the Warrior Code, as if he'd just outwardly defied Pinestar's word. And perhaps you have. A voice crept within the crevices of his mind, its echo loud and haunting. He felt his mouth run dry, his tongue sticking numbly to the bottom of his jaw. Is this really just an innocent request? No - no, no, no...He never - it wasn't as if - quickly he gave himself a shake, his nostrils flaring and a harsh, exhaled snort escaping his lungs, stirring up scraps of cold fog before his very nose. He'd always been a frequent visitor of the medicine cat's den. And the conversations he'd divulged with Tawnygaze were hardly ever intimate; perhaps some polite lamenting on a lack of prey on a leaf's bare afternoon, or a kind offer to scrounge up some herbs on an uneventful morning. Mostly however they would have sat in peace; Gingersplash watching the comings and goings of the bustle of Camp from within her comforting den, and Tawnygaze doing whatever job ought to be done at the time. ...But the silence was always comfortable. Reassuring even. As if, yes, they needed no words to convey how they truly felt. Perhaps their tenuous bond ran deeper than that of idle chatter, or innocuous gestures. Perhaps they needed only a smile, and a purr, to know just exactly what the other was thinking. The thought both thrilled and disturbed him - because, as Gingersplash knew, he looked upon Tawnygaze with something different than mere friendship. But he wasn't sure if he'd call it a surface attraction either. Rather, he felt a tenderness imbued deep within his chest for the snow splashed fae - an attachment that ran deeper than he honestly would've liked. With his tail cloaked across her back, they emerged into the sunlight; strands of gold fluttered down upon camp, catching silver specks of dust in their flaxen fingers. A wind twirled and whistled through the trees, catching a swirl of foliage up in its undying dance, tugging every so gently at the fur of his flank. Green hued optics flashed to the corners of Camp, where a stray Queen lay sprawled on her side, and her audits twitched and twisted at the sound of their paw steps. When her thin pupils snagged the two in their piercing light, Gingersplash felt as though the air had been sucked from his lungs. She turned away promptly, tail flicking, thoroughly uninterested, though the uncertain feeling remained - does she think it's strange? Will she tell Pinestar about it? Is she suspicious? For StarClan's sake, Gingersplash, you're acting like you've just committed mutiny! Still, he felt a prickle of trepidation scratch at the very roots of his paws. To distract himself, his gaze snapped away from the thick of camp, and turned to absorb Tawnygaze in her full glory. She was beautiful - a cliche word to use, perhaps, but it was all he could think of when enraptured by her stunning, lithe form, the way her curves just so gently rose to meet her belly, the fine silken silver of her whiskers as they caught shards of dusty yellow thrown from the sunlight. Her eyes burned orange, like the hot and radiating flare of fire, and he felt powerless when looking into such deep, bottomless orbs, as if she could catch him under a spell just by throwing the tom a glance. Oh fox dung! Perhaps he'd been looking too long. Quickly he looked away, the heat rushing hot and fast to his cheeks. "So I was thinking..." His voice emerged soft as always, though there was thicker foundation now, as if she'd given him a slight bedrock of confidence. He turned back to her, this time reminding himself to not get lost in her brilliant gaze like a lovelorn kitten. "You haven't looked well lately - ah, if you don't mind me saying so." His brow furrowed, concern shadowing his countenance. "Are you perhaps overworking yourself? There's no shame in taking a break every now and then." Almost on accident he bumped shoulders with the she-cat, and quickly Gingersplash pulled away. His paws halted at the very lip of the fresh kill pile, though his eyes never once left her slender form. "Your health is..." Oh dear StarClan, where were the eloquent words when he so desperately desired them? He twisted the sentence into something that, in retrospect, sounded rather awkward, though at the time it had seemed the appropriate thing to say. "Your health is important to me," the warrior finished, with a dip of his cranium. As if to distract himself from what he now realized wasn't exactly the greatest thing to say to a medicine cat - I'm sure she can take care of herself, Gingersplash, you don't have to be such an overbearing mother! - he lunged down and grasped a plump wood pigeon within his jaws, dragging it over with a forced aplomb. "Here," he murmured, puffing out a few feathers caught within his teeth; he quickly snatched up and returned with the limp form of a mouse. Dropping it down by what he'd given to Tawnygaze, he paused, unsure on how to continue on. Green eyes slowly roamed to the heavens above, clouds scattering their surface, and birds catching the thermals and floating upon the warm pockets of rising air with their dark wings outstretched. It brought to mind a chant his mother had used to recite, before he'd been allowed to guzzle his prey whole. "I thank the Stars for all they have given," he murmured, the memory sending a comforting rush through his veins. "For high above my ancestors listen. Look down upon me and smile at this meat. May it sustain the living yet another day. And it is now we can eat." Gingersplash allowed a pregnant pause to hang heavy in the air - oh Morningwind, she truly had been a loving mother. So patient, rocking him to sleep with rushed, made up lullabies, and ancient tales of old. He'd been told many a time the tale of his mother's and father's mating; though they had possessed a firm friendship, it was naught romance that had driven them to bear kits. Morningwind had been so desperate for a family, and so had Blackwhisker; he wondered, with a vague hint of amusement, at how rather unorthodox their agreement and union had been. Still it had resulted in a rather small, but undeniably happy family. Morningwind became a Queen, and Blackwhisker...a father. A father. How thrilled he must've been. The word sent a tingle prickling at his heart. Gingersplash was snapped back to the present by a corvidae's caw carried high on the wind. "Oh! Apologies," he mumbled, realizing all of a sudden how strange his ritual must've seemed to an outsider's eyes. "It was something my mother used to say, before I was allowed to eat my food...You see, she said that every fresh kill in our pile was thanks to a higher power, and that we should recognize StarClan's grace and mercy upon our Clan...it's an old Queen's poem, but it's stuck with me ever since." Tawnygaze couldn’t help but notice her companion’s distress as they stepped into the light. Nervousness shed off his pelt in waves, the scent of it cloaking her nose with anxious contagion. She didn’t know what it was that had him so off put all of a sudden, but it had done a thorough job. His eyes darted about the camp like jaden missiles, searching for any sign of…something, she wasn’t sure what it was he seemed to be looking for. A lone queen seemed to catch his worried focus for a moment, but her attention on them was passing at best. Still, the tom remained tight in a way, his movements just a little too measured and his attention just a little too split. Was he ashamed to be seen with her? Sure, she was the medicine cat, but beyond that what usefulness did she really serve? Tawnygaze’s posture curled downward along her spine ever so slightly, her shuffling appearance making her look more like a hobbling tortoise than a proud Skyclan cat. She walked with a hunched and troubled gait, always struggling to keep up with the rest of the clan and always falling behind. She was a liability, and that was hardly forgiven by her knowledge of herbs. Tigerpaw had a knowledge of herbs, and four functioning limbs, already her apprentice outshone her based on that alone. In all honesty she felt as a stand in, just a placeholder until Tigerpaw could finish her training and take her place. She wondered if the clan were counting down the days until they could have a fully mobile medicine cat. Golden orbs shifted to observe Gingersplash’s profile, her lashes shadowing her gaze with shy invisibility. Was that what he thought of her too then? Was that why his gaze shifted from place to place, following the breeze like it held some sort of warning? Was he looking for someone to aid in his escape from her company, or was he avoiding being seen with her at all..? Tawnygaze bit down on the inside of her cheek, her ears flickering backward in pained torment. It shouldn’t have bothered her so much, that perhaps Gingersplash didn’t enjoy her company as much as she thought he did, but for some reason it set a subtle pang through her chest. Since her arrival in the medicine den, the warrior had been an almost constant presence – almost as much as Juniperjaw herself – and in that time they had developed a… A friendship? An acquaintanceship perhaps? There was something, though, something undeniable that hovered between them like a hint, like a suggestion of movement, it whispered that she should take a step in faith, it enticed her forward with sweet words and coos of affection, but thus far she had purposefully ignored its appeal. Now, watching the way his eyes danced across their surroundings, she wondered if she had misread something in their…whatever thing they had together, if it was anything at all. Then again, her thoughts turned to his tail still draped across her back, guiding her along with him, and she was surprised by a twinkle of hope which lodged itself into the corners of her heart. ”So I was thinking…” Tawnygaze blinked at his voice, not quite startling at it due to the gentle emergence it always seemed to carry. Gingersplash was a soft spoken cat, his conversation building in tone and volume as it progressed, but always starting softly and with care. She liked that about him. Of course there were a great many things she liked about him, but she pushed them down to pay attention to what he was saying. ”You haven’t looked well lately – ah, if you don’t mind me saying so.” Now their eyes were fortuned to meet, and she searched his gaze for any sign of contempt or malice. The only shadow she found upon his expression was that cast by concern, though, and a twinge of guilt passed her mind that she had thought to look for anything different. But in her search to find something cruel in him, she had yet to answer his question. ’Now who’s being cruel?’ Tawnygaze bit her lip, triangular auds tipping back in discomfort. She didn’t know how to answer him, she didn’t know how to explain the unimportance of her health. ”Are you perhaps overworking yourself? There’s no shame in taking a break every now and then.” His shoulder jostled her gait then, causing her to almost misstep and stumble. To keep herself steady she paused there where his warmth departed, his ginger form pulling away to stop at the freskill pile like a fiery beacon. His eyes never left her, though, and watching him as she was – her breath hitched and still in her throat, her body crouched and lilted to one side with her tail a constant circlet of ginger tabby to conceal her grotesque leg – she forget again that she had yet to answer him. His concern was like an entity all its own, comforting and soothing in its presence. It washed over her like a soft caress, the ghost of his affection trailing its muzzle along her cheek and down her side in sweet fondness. ”Your health is…” Oh right, her health, her health was what? Failing? She dug through the fog in her mind to remember what he had been saying. She looked unwell. Unwell? Was she feeling unwell? In all honesty, perhaps she hadn’t been at peak form lately, but that was no reason to say she was doing unwell…was it? ”Your health is important to me.” Tawnygaze sucked in a short gasp of air, a barely audible sound yet it was there all the same, as insignificant as the rest of her existence. ’Your health is important to me… Important to me…’ Important? Had she ever been important to someone before? She could have stared at him for hours after he dropped those baffling words upon her, but as he lunged to retrieve a plump pigeon from the pile, the spell over her was broken and she threw her gaze downward to avoid being trapped by him again. ’Important to me…’ Was it truly? Was she? ”Here.” Her silent wonderings were jarred and jumbled as the bird appeared beneath her nose, Gingersplash’s soft murmur accompanying the fresh meal. She smiled shyly at the feathers caught between his teeth, something about his imperfect display endearing him to her in a way she was unfamiliar with. ”Thank you…” Merely a breath, she wasn’t even sure if he heard it, but to be honest she was hardly aware she had spoken at all. Her mind was reeling back and forth with questions and no answers. She couldn’t decide what to think of his behavior, and any conclusion she came to seemed immediately to be wrong. It was bewildering and frustrating and in no small amount exhausting trying to keep up with all the scenarios her mind produced to elucidate his actions. She was getting herself worked up over it, and she knew it, her heart kept hammering and her stomach was turning over and over. If her father were here he would calm her down with a few soft spoken words, but the older tom was nowhere in sight leaving her to sort out her problems on her own. The medicine cat looked at the pigeon that her… That Gingersplash had given her, quickly noting the size difference between the plump avian and the scrawny rodent which the warrior returned with. She wanted to protest, to explain her stomach was far too unsteady for her to eat such a large meal, that she would be more than happy with the mouse and he could surely use more food than she; but instead she looked at him with her mouth open and no words to show for it. She closed her jaw and tried again but received only the same. Unlike in the medicine den, when his eyes had been solely on her, his jaden gaze were turned toward the sky, watching the clouds and birds in their domain. By the time he would look back, she would have already looked away, her expression unreadable in its turmoil. Knowing it was bad manners to refuse a meal not only brought down by a warrior, but delivered by a warrior as well, Tawnygaze dipped her head and took a delicate sniff of the creature. It was fresh, it had probably been brought in no more than a few hours ago, and on any other day it probably would have made her mouth water. On this day, however, it made her stomach roil and flip with something not unlike nausea. Had she become so bothered by Gingersplash that now she wouldn’t be able to eat? Taking a deep breath, steeling herself with defiance, the medicine cat took a small bite and took her time with swallowing. I thank the Stars for all they have given. For high above my ancestors listen. Look down upon me and smile at this meat. May it sustain the living yet another day. And it is now we can eat.” Tawnygaze watched him through the mantra, noting the way the words seemed to spread a relaxing wave across his frame. Odd as they were, they certainly had some sort of effect over the tabby warrior. Her head lilted to the side ever so slightly, a delicate question asked by posture alone and the prim smile with curled her lips in a tender expression. Gingersplash was quick to apologize when he must have noticed her watching him, his mumbled penance snapping the femme to realize she had been staring at him with that stupid grin on her face. Starclan what was she thinking?! She quickly shook her head, looking anywhere but at him as a brilliant flush heated her cheeks. Had it not been for the fur, she was sure he would have seen her entire face turn bright red. ”Oh no, don’t apologize, it was quite a lovely prayer.” Her voice was soft and grew only softer with her meek disposition. She had embarrassed him – oh she wanted to disappear! – and to put something between her affront and his awkward response, she forced herself to take another bite. It was something my mother used to say, before I was allowed to eat my food… You see, she said that every fresh kill in our pile was thanks to a higher power, and that we should recognize Starclan’s grace and mercy upon our clan…it’s an old Queen’s poem, but it’s stuck me ever since.” His explanation of his mother’s influence struck a chord in the young fae. She knew his relationship with his foster mother was…tense, to say in the least, and he had often used the medicine den as a refuge to escape her, but she had never stopped to wonder what his real mother had been like. A ring of sympathy passed through her, both of them had lost their mothers so young, perhaps they had more in common than she realized… Tawnygaze took a breath to steady herself for what she was about to do, drawing upon every ounce of courage in her petite frame. Her ears tilted back, and her brow furrowed in troubled seriousness – a look which could too often explain her muse unfortunately – she dared to reach a paw forward and daintily place it upon one of his. ”You’re lucky to have those memories.. Never apologize for them.” Her words were gently spoken, but there was something strong in them as if for once she believed in what she was saying. ’Important to me…’ Could it be…? He was a fool. An injudicious, insouciant, dispassionate fool. Unlike himself, so carefully guarded and masked was he that barely even the most subtle of emotions could break through his guard, Tawnygaze resonated with something completely different; she was vulnerable, a butterfly of wet and struggling wings, so desperately attempting to fly and yet achieving naught with each struggled flap. He did not miss the flash of pain that sparked like the beginnings of a flame within her gaze - and seeing that twist in her countenance, catching that mournful dip of her head and the droop of her immaculately plumed tail, well, it was enough send a reverberating pang of dead quaking at his heart. Had he done something wrong? Had he upset her? Was his poem insensitive? By StarClan's name he couldn't figure out the reasoning, but hurting Tawnygaze had been the last thing on his agenda. He so desired nothing more than to throw away his mask, to reveal all that shone within him, all that flared bright and strong, and Gingersplash realized with a jolt that he wanted her to see him. Not the surface that so many others saw, no - but him in its entirety, beneath the willowy neck and supple muscles, far beyond the sheen fur groomed to a pristine perfection. He wanted her to see him for who he truly was; a lonely tom, as vulnerable perhaps as she, and dear StarClan did he love her company more than the aforementioned heavens themselves. Gingersplash was surprised at the rush of emotions that flooded through his veins. He felt sure something must've broke through his mask, felt absolutely certain that his countenance revealed more than he would've liked. But for as brief as that moment was, Gingersplash swallowed it promptly down, buried it, until it was ten feet below a mound of imaginary dirt, hidden and kept secret once more. It wasn't that he wanted to hide his true self from Tawnygaze - it was just how he instinctively reacted. Moons of burying his emotions, and nowadays it felt like the only talent he possessed. Huh. Amusing, he thought, with a wry twist upwards at his muzzle. It was then however that something completely different occurred. ”Oh no, don’t apologize, it was quite a lovely prayer.” Her gentle lyric floated from her maw at just the right time, for Gingersplash had been preparing a very hurried apology just at that moment. A pause stung sharp at his gullet; mouth hung agape, before he quickly remembered it was impolite to stare, and squeezed his jaws tightly shut, glancing quickly away. "You uh..." Gingersplash cleared his throat, searching desperately for the right words, but as usual her simple presence stole him of breath. Meadow hued orbs slipped back to her graceful form, unable to keep away for two long. Eyes connected, and his adams apple bobbed, his mouth uncomfortably dry. Her words only seized at his bones, rippling flames of strong emotion coursing through his veins like a wildfire. He adored the effect her gentle and melodic intones had upon him; they stayed consistent, as mellow as the forest in twilight; cool and soft and resonated with a hidden, whispered meaning. Thank you. That was what he longed to say. But the words twirled restlessly at the tip of his tongue. Instead he wasn't sure if mere words could describe the feelings he was experiencing right now; emotions of acceptance, of being valued, of being something more than just 'another warrior.' So many looked at him with that callous gaze of carelessness; oh, yes, we know Gingersplash, but he's the background character, far less interesting than his brilliant siblings. The taunt echoed within the crevices of his mind. But then a paw rested upon his own, its touch a soft and reassuring embrace, the fur brushing against his down. It drew silver glinting talons from their sheaths, digging deep into the earth. And perhaps that was what made Gingersplash lean in, until their whiskers touched, until their noses were a mere space apart. Her scent coated him in its gentle wreathe, a soft clock to envelop his scent glands, to wash over his pelt like a slick wash of water. A sigh escaped his lungs, stirred up a scrap of fog before his very nose, but it was a sigh of undeniably luxurious contentment. It was then that the warrior brushed her cheek with his own, rasping a salmon pink tongue gently up the sullen circle of her flank. To an outsider it would merely appear as a friendly gesture. 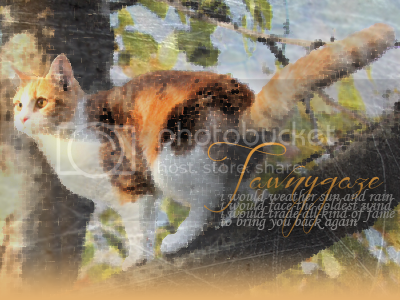 After all, most cats partook in sharing tongues - but to Gingersplash, the brave action meant a whole lot more. It conveyed his affection and thankfulness to the utmost degree. Another long, lulling rasp of his tongue, and he paused somewhat, intoxicated now, eyes half lidded, his breath soft and in symphony with her own; "and you should not apologize for who you are." He wasn't thinking now. The words escaped as soft as velvet, surging with truth and passion. "You see only a twisted limb, a form broken and useless. But I see so much more. Before me lies a molly as beautiful as the fourtrees at twilight, as talented as any medicine cat to exist. I've watched you for what feels like moons now." A tail brushed comfortingly at her shoulder blade. "Trust me," he purred, rich and strong; "I would know." And never before in his thirty nine moons had he been more certain, more confident, about that aforementioned fact.